It is back and the countdown is on for the Arklow Rocks Fun 3 day Summer Camp. From Tuesday 24th to Thursday 26th July. All boys and girls welcome up to ages 12. We have more games packed into this camp and a few surprises. Not to be missed! Camp includes fun games, skill challenges (although no previous skill necessary!) and all run by qualified coaches. Arklow Rocks Parnells Hurling and Camogie Summerr Camp is open to children between the ages of 5 to 12. The hours of the camps are 10.00am to 2.00pm on Tuesday, Wednesday and Thursday, 24th to 26th July. Please be punctual dropping off and collecting your children. Arklow Rocks Parnells Hurling and Camogie Summer Camp will include a camp t-shirt in the cost. Arklow Rocks Parnells Hurling and Camogie Summer Camp reserve the right to suspend or cancel the day’s camp if necessary due to bad weather. In cases where the weather is deemed so bad that the coaching activities need to be suspended, the co-ordinator will be available to supervise indoor activities. Should the weather show no sign of improving, the co-ordinator will contact the parent/guardian to advise them and it will then be the responsibility of the parent/guardian to make arrangements to collect the child. The coaching staff will of course supervise all children until they have been collected. 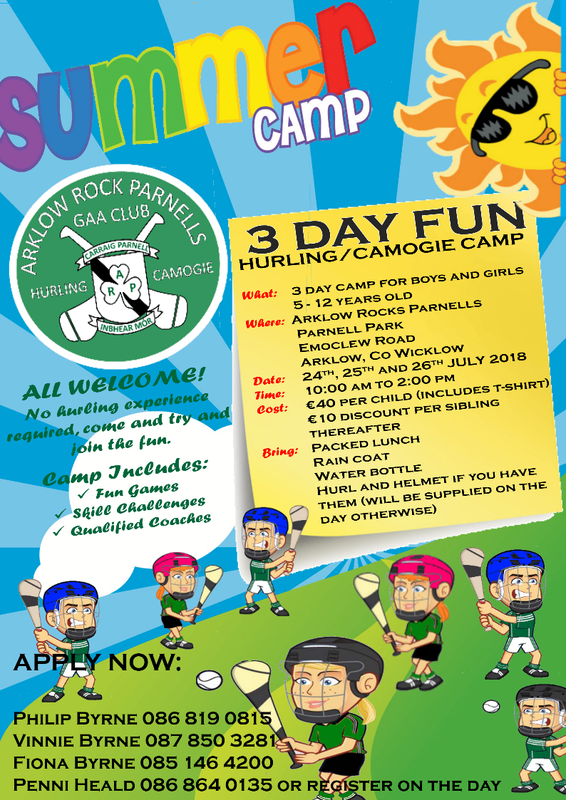 Arklow Rocks Parnells Hurling and Camogie Summer Camp will operate to the highest standards but it cannot be held liable or responsible for damages, injuries or loss of possessions. We advise valuable items to be left at home. Respect fellow team members regardless of ability, cultural or ethnic origin, gender, sexual orientation or religion beliefs. Due to the adverse weather conditions our pitch is unable to host an Easter Camp this year. We will be looking at adding an additional event to make up for this later in the year. Summer Camp is being planned now….more details to follow!